We’ve looked at plants, and now I will briefly introduce the five other kingdoms of life here — bacteria, archaea, fungi, protists and animals — and my focus will be as much on what they do as on what they look like. You may wonder why it’s so important to learn about all of these guys when you’re reading a lesson about gardening. They’re as important to the garden as the sand, silt, clay, fertilizer, water and everything else. They make the soil and maintain it. They build villages and delegate tasks based on their individual strengths. Many are extremely small, but despite their size, they rule the world — and they rule our gardens. They transform the minerals and organic matter in the soil into something that can support an abundance of life. Many nutrients won’t be taken up by plants until microorganisms have converted them to the right form. Some of them pull nitrogen out of the air and change it into a form that they, and plants, can use. Some bring nutrients directly to plants in exchange for food from those same plants. Without a vast array of soil food web players, we wouldn’t have soil. They also work to protect plants from plant-feeding predators, both in the soil and above ground. Some of them eat dead things and some of them eat living things and eventually they die themselves. All of this contributes to the organic matter and mineral content of our world. Yes, a few of them also eat plants, but the vast majority are friends of plants — just like the vast majority of bacteria in our body are our friends. 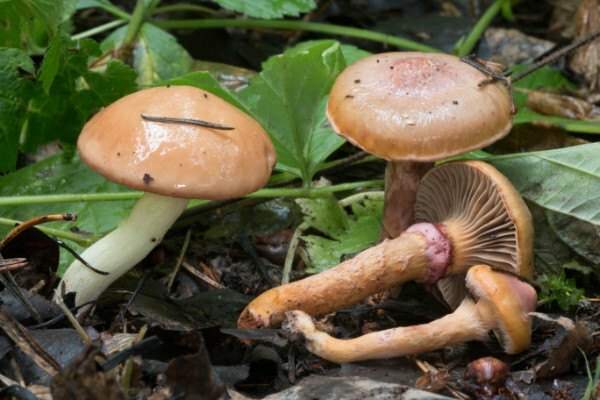 These Slippery Jack mushrooms (Suillus granulatus – the slimy ones that are standing up) are mycorrhizal – i.e., they share nutrients with plants. 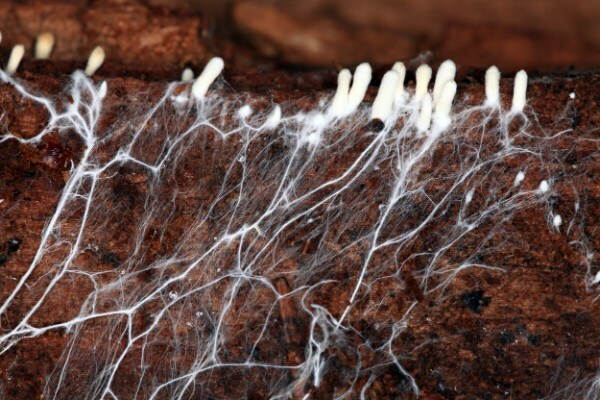 This species has edible fruiting bodies, though not all mycorrhizal fungi do. If we use toxic chemical fertilizers or pesticides, or withhold water from the landscape (such as by using drip irrigation), or do a lot of deep rototilling or other soil disturbance, many of these soil workers probably won’t be around for very long. Even if we do something seemingly benign, like use any of the horticultural soap products, we destroy many of them. We really, really want them to be around. Without them, our garden becomes a desert. So rather than thinking about taking care of our plants, it might be more appropriate to think about taking care of our soil food web, including our bacteria, fungi and protists — our microorganisms, or microbes for short. Getting familiar with them is the first step towards creating a healthy garden. Some of our most important gardening tasks involve making sure we have enough microbes. Most of our other tasks involve making sure they have what they need. Some microbes breathe air, just like us. They’re called aerobic microbes. Other microbes die in the presence of gaseous oxygen, so they live in places where there is none, such as deeper in the soil. They’re called anaerobic microbes, or anaerobes. Yet another group of microbes called facultative anaerobes can actually switch their respiration depending on whether or not there is sufficient oxygen present. The human pathogen E. coli belongs to this last group, but so do many beneficial microbes, such as the yeast that makes bread. 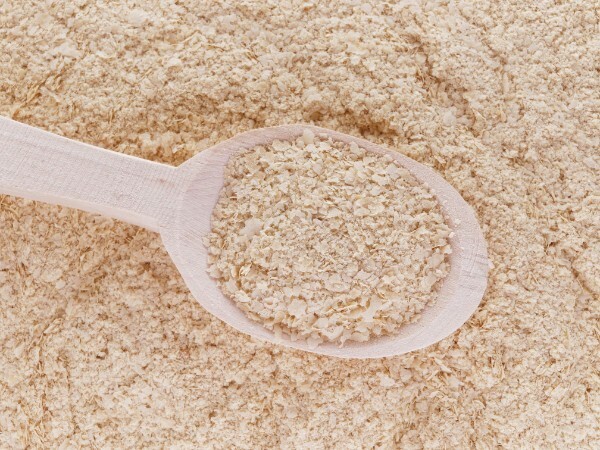 Brewer’s yeast, bread yeast, and nutritional yeast (pictured here) are all varieties of the same facultative anaerobe species – Saccharomyces cerevisiae – which is also in Effective Microorganisms, sort of a probiotic product I use monthy in my garden. In general, we want to promote the aerobic microbes in our soil because they tend to be the beneficial ones. Anaerobic microbes are not bad in themselves, but the by-products of their respiration and metabolism include hydrogen sulfide and other ingredients toxic to plants and other soil life. Microbes need water, some more than others. Bacteria, in particular, need a moist environment, whereas fungi can handle it a little bit drier. Some microbes need light. In fact, some of them photosynthesize like plants. They all function best in their own specific temperature range. They slow down when the soil freezes, some of them going right to sleep, but many of them working right through the winter. As it warms up in the spring, more and more of them wake up and get to work, just as the plants are waking up and need the services of these tiny friends. Bacteria are the tiniest members of the soil food web. They are single-celled organisms — they each have just one cell. There are hundreds of millions of them in a gram of healthy compost, even a billion. Pick up a handful of good compost and you have more bacteria in your hand than there are people in the world. 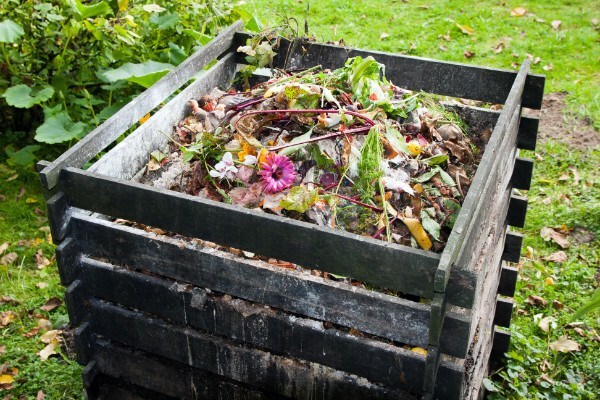 Different types of bacteria dominate at different stages in the composting process. How is it possible that anything is that small? I can’t even fathom it, just like I can’t understand how there are at least 100 trillion stars in one galaxy and 100 trillion galaxies in the universe. The astronomers have lost me here, and the biologists have lost me when I try to imagine the tens or hundreds of billions of bacteria in and on my body, about as many as there are cells that make up my body. Bacteria consume minerals by taking them in right through their cell wall. They can swap DNA and other body parts with each other, so a colony can learn extremely quickly. This could be the basis for a good horror movie. Actually, it’s a real phenomenon that not only bacteria but insects and weeds are becoming more and more resistant to our antibiotics and pesticides. Bacteria occupy the majority of the leaf and root surfaces of a plant. They break down simple substances and toxins and aggregate the basic building blocks of the soil. Some common bacteria are Lactobacillus, Rhizobia and Pseudomonas. Bacteria are dominant in aquatic systems and the soil of grasslands, whereas fungi become more dominant in the soil of shrublands and forests. Archaea make up a whole domain – a bigger classification than a kingdom. There is another single-celled group called archaea that I lump in with bacteria, but don’t tell any microbiologists that because they probably wouldn’t be happy with me. Apparently, archaea mostly look kind of similar to bacteria but have genes that are more similar to plants and animals than bacteria. There are many more differences that have caused some biologists to classify them in their own kingdom. 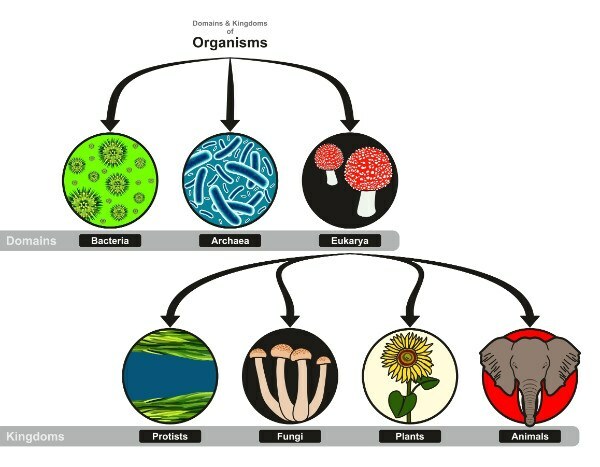 For our purposes, bacteria and archaea are classified together because their cells don’t have a nucleus, whereas everyone else’s does — fungi, protists, animals and plants. In some forests, the total mass of fungi outweighs the trees! Fungi provide many of the same services for plants as bacteria. They may be single-celled (such as the yeast that makes your bread, yogurt, wine and beer), or they may have billions of cells (like in a mushroom). A mushroom is the fruit of certain types of fungi, but the majority of mushroom biomass is actually underground, winding through the soil kind of like a microscopic root. They form string-like hyphae, many of which join together and form a mycelium. In one minute, some fungi can grow five times further than a bacterium will travel in its whole life, though that’s still too small for us to see with our naked eye. Fungi generally eat by excreting digestive enzymes that dissolve their food, which they then absorb through their cell wall like bacteria. They eat complex organic materials that most other living things can’t easily digest (such as lignin), and they harvest minerals from rocks that are virtually inaccessible to other organisms until released by the fungi (such as phosphorus). It’s a good thing because plants need this phosphorus, and often can’t get it themselves. Some fungi form a special relationship with plants and actually attach to the plant root. Some of them go right inside the root, and even inside the cells of the plant. They are called mycorrhizal fungi (“myco” means fungus and “rhiza” means root). These fungi are especially good at harvesting and bringing minerals up to the plant, but they also bring nitrogen and even water. They’re so important for plant health that there are inoculants you can purchase in order to bring them into your soil. Like bacteria, fungi get food in the form of carbohydrates from the plants in exchange for their services. Sure, some of them such as powdery mildew also eat plants, but in the big picture, this is a good thing. Someone has to eat the unhealthy plants in our garden, and we sure don’t want to. I haven’t gone into detail yet about how microorganisms don’t like to eat healthy plants. I’m saving that for later. Some fungi also eat bacteria, and others eat the microscopic wormlike animals called nematodes. Some bacteria and some nematodes turn the tables and eat fungi, too. Everyone has to eat, right? Fungi dominate forest soils. In a grassland, the total biomass of bacteria is more than that of fungi or is occasionally even at a 1:1 ratio. Mycelium are generally a lot bigger than the fruiting body for most mushrooms. In a deciduous forest, by contrast, the fungi to bacteria ratio may be 10:1 or more, and in a coniferous forest, 100:1 or even 1,000:1. Knowing that grassland soil is dominated by bacteria and forest soil is dominated by fungi helps us understand why it isn’t always true that a field will eventually become a forest. Until the soil community changes, the plant community won’t change. Where these two systems come together at the edge of the forest, a drastic change in the soil food web can occur in as little as a six-inch distance. If you have a field that can’t seem to grow anything other than short grass, it probably needs to be inoculated with the right microbes to support longer grass, or to eventually support a forest. There is little point in planting any trees until the correct soil food web has been established. When we put our mulch on the soil surface, particularly a wood-based mulch, we are promoting more fungal growth. When we incorporate it into the soil, we promote more bacterial growth. Also, if we till our gardens, we cut the fungi hyphae all to pieces, resulting in a bacterial-dominated soil. Trees, shrubs and perennials (most fruits) prefer fungal-dominated soil, so if we’re trying to establish a shrub garden or grow trees, it makes sense to leave the mulch on the surface. 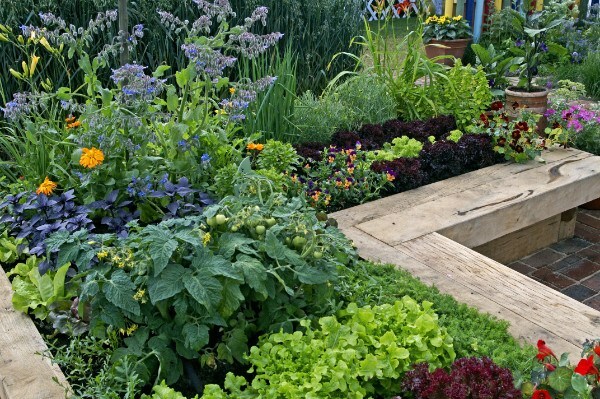 Annuals (most vegetables) prefer a bacterial-dominated soil, so we may turn the organic matter into the top couple of inches. Fungi only occupy 5-20% of the leaf surface, but it’s important for them to be there to compete with certain disease-causing organisms. They’re also very good at breaking down more complex substances in the soil, and scavenging for and holding onto minerals, especially calcium. They are the kings when it comes to building soil structure with their miles of mycelium. Fungi have an energy to them that you can almost feel. I gained a deeper appreciation for them when I started growing mushrooms and eating them. Yes, many of us eat fungi, and some fungi eat us. It’s the cycle of life. Protists are the outcasts in the microbe world, their main distinguishing feature seems to be what they aren’t — they’re neither bacteria nor fungi nor animals nor plants. You may be familiar with some such as the amoeba and the paramecium. Many of them are single-celled, but not all. Sometimes they join up to form wonderfully gooey slime molds that can actually work together as one, navigating a maze in order to get to the food hiding at the finish line. 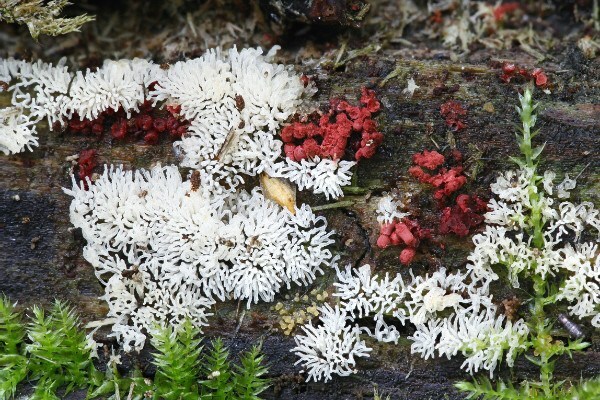 While “slime mold” may sound kind of gross, some of them are actually quite pretty, like this white coral slime mold or this red carnival candy slime mold. The kelp you may have seen washing up on ocean beaches (a type of algae that’s now manufactured into one of the most popular organic fertilizers) is actually a protist, not a plant. Algae produce the majority of the oxygen in this world, so it’s good for us that they are around. There are also some protists that have given us some problems. Phytophthora causes blight in potatoes and was a major contributor to the great Irish famine that caused over 1 million people to starve to death in the middle of the 19th century. Another Plasmodium causes malaria in humans. Despite the unpopular ones, protists are mostly beneficial, and — like us and all other forms of life — they’re just trying to get by. A protozoan can eat 10,000 bacteria in a day. With 10,000 amoebae per teaspoon of soil, they can eat 100 million bacteria each day. During this process, nitrogen is converted to ammonium, upon which many of your plants will happily dine. We say that bacteria and fungi immobilize nutrients by storing them in their bodies, and then protists (along with other microbes, plants and animals) mineralize these nutrients — meaning they make them available again, by eating the bacteria and fungi. Protists also form many symbiotic relationships with bacteria, where each benefits the other. Protists live in a liquid environment, mostly in the water, but some of them live in wet soil and have some similar roles to bacteria and fungi. We don’t specifically talk about them all that much in gardening, but when we talk about bacteria and fungi, they’re often implied. Humans, dogs and birds are all animals, and worms and insects are classified as animals too. So are the microscopic nematodes that eat the grubs in your lawn. 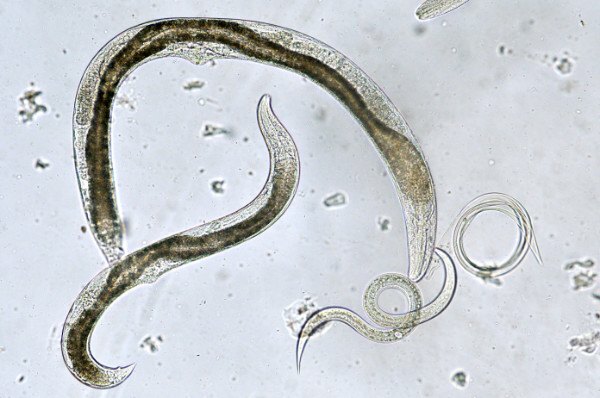 Some nematodes cause problems for gardeners, but most are beneficial. Many animals live in the soil as part of the soil food web, and most animals influence it with their manure. Some animals eat only plants. Some eat only other animals, but often those animals ate plants, so ultimately all animals rely on plants for food. All animals also rely on microbes. Animals have a big part to play in the garden. Their manure is organic matter and fertilizer for the soil, and it often contains seeds transported from somewhere else that will germinate and grow into plants. Plants have been very clever to buddy up with animals for this purpose. Sure, they have to manufacture some fruit for this process to take place, but their species will live on, so it’s worth it. 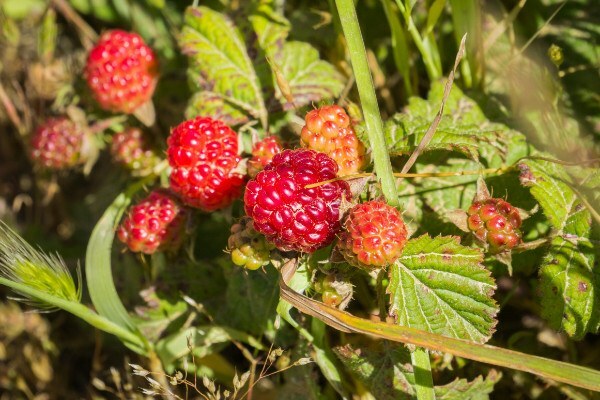 The seeds of some plants, like the California Blackberry (rubus ursinus), won’t germinate at all unless they’ve passed through the digestive tract of a bird. Plants are pollinated by animals, especially birds, bees and butterflies. The colony collapse disorder that is plaguing the bee world is a problem not only because we won’t have honey, but because we’re losing one of our main pollinators — and therefore our food. Insects (such as mites) and microscopic animals (such as nematodes) are largely responsible for making minerals available to plants as a result of eating microbes, just like the protists mentioned above. They also transport microbes around the soil just by moving around. Otherwise, many of the microbes wouldn’t get very far. Just these animals being there, eating plants, walking around, howling at the moon — as we’ll discover, it’s all important for a healthy garden. All of these members of the soil food web exist in the same space. They work together and they also compete. They fight wars for land and food and water, and they join together to produce these same things. There is competition, but there is also cooperation. None of this is bad — it’s just nature. It’s all good. As gardeners, we are thrilled by this cooperation because it allows us to garden, to grow healthy food and beautiful flowers. The cooperation between plants and microorganisms is fascinating. The microbes bring food and water to plants in exchange for other food that is made by the plants. This is the original bartering system. Plants can send well over 50% of the carbohydrates and thousands of other substances they make during photosynthesis into the soil as exudates (food) for microbes. The microbes give plants the food they need in return, as well as protection from predators. These exudates are one important method plants use to build soil. Perhaps the most popular example of cooperation is between plants and pollinators — mainly insects and birds. Plants custom-make food specifically for their pollinators, who come and get the food. 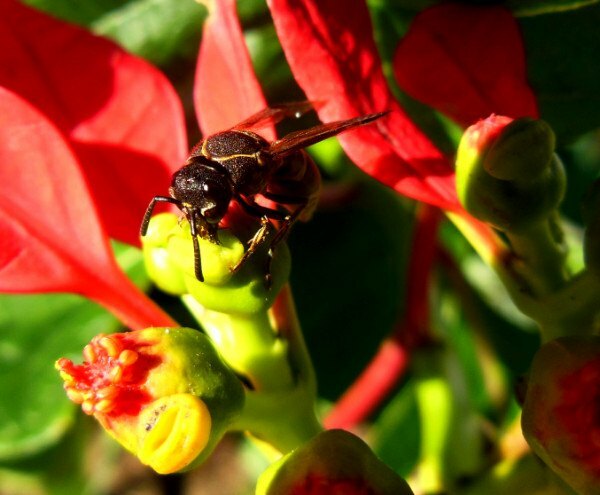 Wasps can be important pollinators too, like this one pollinating a Euphorbia flower. In the process of moving from flower to flower, they pollinate the plants. One of the most interesting examples of cooperation in the soil is nitrogen-fixing bacteria, many of which live in little homes right on the roots of certain plants, mostly legumes like clover and peas. These bacteria take the nitrogen out of the air and change it into a form the plants can use. Plants can’t do this, but they can get carbon out of the air — something the bacteria need. Thus begins the trading that allows all other life on earth to exist. Certain species of microbes colonize the leaf surface, contracted to defend the leaves against predators and pollution. If they aren’t there, the plants won’t last long. Many other species set up shop in the rhizosphere, the area right around roots where much bartering takes place. Plants send out certain foods to attract the specific microbes they need at any given time. There are endless relationships like this. It’s important for us to realize that we need all of these players in our garden in abundance. We need a lot of them and we need a diverse group. Just like we don’t want to plant monocultures, we don’t want bacterial monocultures, or fungal or animal monocultures, either. In fact, if we only have a few of the 30 or so functional groups of microorganisms (groups that have similar functions, such as nitrogen-fixing, decomposing, or photosynthesizing), then our garden will gravitate toward becoming a desert. We can artificially keep it alive for quite a while, but we will also see the system get sicker — as we are seeing right now all over the planet. We will have more and more plant predator problems, and eventually, nothing grows. We need to promote diversity in the soil food web. More important than how many species we have is how many functional groups we have. In nature, this cooperation and competition produce environmental prosperity, and it can do the same in our gardens. When it does we start having other issues we have to deal with, but these are good problems to have. It’s a good problem to have so much food coming out of your garden every day that you can’t possibly eat it alone. Even at a small scale, a thriving garden is home to much more than just the food we plant. It’s a good problem when you have to be careful where you throw an apple core because there’s a good chance a tree will form. It’s a good problem to have an orchestra of birds waking you up in the morning and bees buzzing around your back door. The reason it’s helpful to learn about the members of the soil food web is that our main goal is to support them in order to have a healthy garden. Knowing what they need helps us achieve that goal. 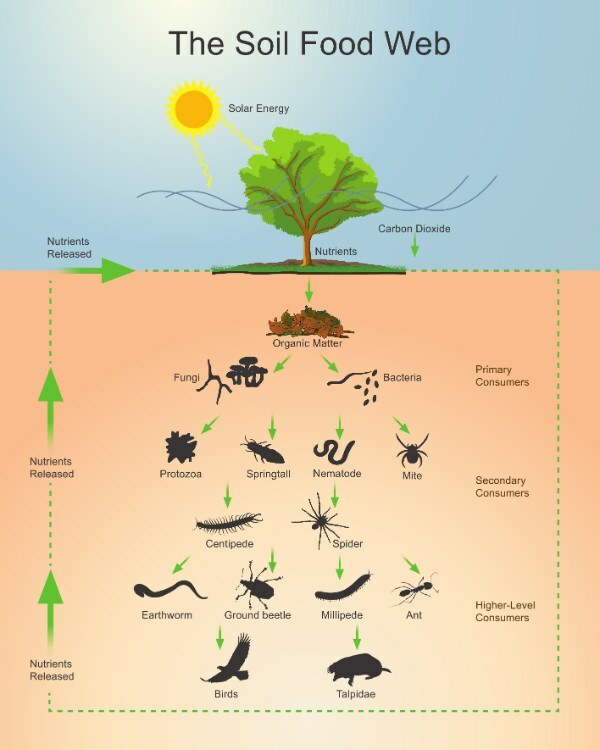 Healthy soil depends on the web of relationships between many different kinds of organisms. Microorganisms, animals and plants scavenge the soil, water and air for nutrition. Through competition and cooperation, microorganisms, animals and plants recycle and trade nutrients, create healthy soil, provide each other with defense and other services that keep the system balanced. These all have important roles to play in creating a healthy garden, and our job is to tweak the system to provide all of them optimal living conditions so they can do their work.